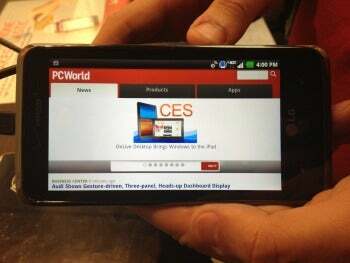 Stopping by Verizon’s booth at CES, we managed to get a brief hands-on with LG’s new LTE phone the LG Spectrum. The phone was announced at yesterday’s LG press conference, but this is the first time we got a chance to actually handle the phone. The first thing that really stands out on the Spectrum is its awesome screen. The 4.5-inch 1280-by-720 resolution display has the same IPS technology that LG uses on their premium line of HDTVs. With 329 pixels per inch (ppi), the LG Spectrum has a very slight edge on pixel density versus the iPhone 4’s “Retina” display. Pictures and text looked sharp, and the Spectrum had great viewing angles. Unfortunately the Spectrum was tied down to the booth, So I wasn’t able to get a good sense of how the phone felt in hand. The LG Spectrum can connect to Verizon’s 4G LTE network and runs Android 2.3 (Gingerbread). Inside, the Spectrum has a dual-core 1.5GHz processor with 1GB of RAM. All that processing power means the Spectrum is great for running games and I enjoyed a few minutes with the Need For Speed app while hanging out with the phone. I was able to test LTE connectivity using the FCC approved Ookla Speed Test app and managed download speeds of around 8mbps with upload speeds ranging between 10 and 11mbps. The LG Spectrum has both a rear and front-facing camera. I took several pictures using the rear 8-megapixel camera and was quite satisfied with the quality. Photos came out clear, though the colors were slightly muted. The 2-megapixel front-facing camera can be used for video chatting, but photos taken with it had a grayish cast to them. The Spectrum comes with 2GB of onboard storage, but also contains an expandable microSD card with a 16Gb card pre-installed. I was told that the Spectrum would be capable of around 9 hours of continuous talk time, though that was something I wasn’t able to test on the show floor. The LG Spectrum will be coming to Verizon on January 19th and will retail for $199 with a new 2-year contract. We’ll let you know our complete thoughts on the Spectrum in our upcoming review.